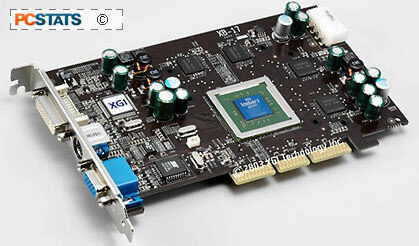 The Volari V8 is XGI's high-end graphics solution. 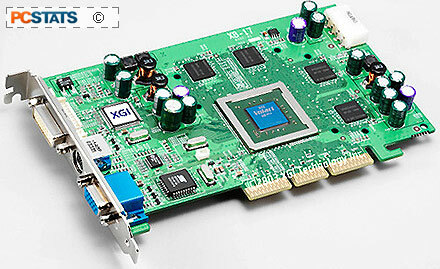 Clocked at 300Mhz, this 90-million transistor Directx 9.0 chip can support up to 256MB of DDR or DDR2 memory at speeds of over 325Mhz for DDR and 450Mhz for DDR2. The XGI V8 will feature 8 pixel pipelines (each with two texture units), 2 vertex-shading units and 4 pixel shaders. Combined with the 300Mhz clock rate, this will give it a fill rate of 2.4GP/s and with the dual texture units for each pipeline, 4.8 Gigatexels. Combining the 128-bit memory bus that all Volari chips use with the memory clock, we will see peak transfer rates of 14.4GB/s (128-bit * 450Mhz * 2(ddr) / 8 (bits to a byte)). The V8 will be capable of 2x or 4x Full-scene anti-aliasing (FSAA). The XGI Volari V8 will also be available in an 'Ultra' version clocked at 350Mhz (2.8GP/s/5.6GT/s/16GB/s) with comparatively faster memory timings of 375Mhz and 500Mhz respectively for DDR and DDR2. A pair of V8 or V8 Ultra chips go into each Volari Duo V8/Duo V8 Ultra. The Volari V5 also comes in an 'Ultra' version with higher clock and memory speeds, two of which chips make up the Volari Duo V5 Ultra. Doing the math gives us specs of 1.2GP/s and 2.4GT/s for the regular V5 and 1.4/2.8 for the higher clocked 'ultra' version. As the V5 is clocked identically to the V8, the peak memory bandwidth should also be the same at 14.4GB/s (16GB/s for the ultra).